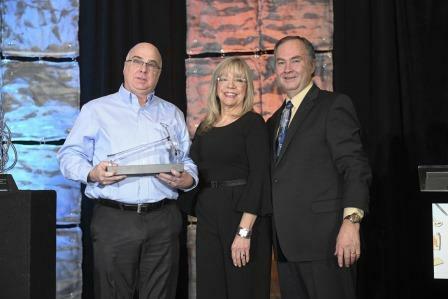 David Koenig, Crossville VP and General Manager of Crossville’s distribution division, Crossville Studios, receiving the Crystal Vision Award. Crossville Inc. was recently recognized as the 2018 Crystal Vision Award recipient by World Vision. World Vision is a Christian humanitarian organization known for its global and domestic commitment to community development, disaster response, and child well-being. The award was presented at an event held during the Kitchen and Bath Industry Show in Las Vegas in January. The award is in recognition of Crossville’s longtime commitment to helping reduce poverty issues through its ongoing donations to World Vision. Crossville’s David Koenig was on site in Las Vegas to receive the award on behalf of the company. “We are honored to receive the Crystal Vision Award from World Vision. It’s extremely gratifying to know that families and communities around the world are benefiting from our tile products at times of greatest need, often as they struggle to rebuild after natural disaster,” says Koenig who serves as VP and GM of the Crossville’s distribution division, Crossville Studios.